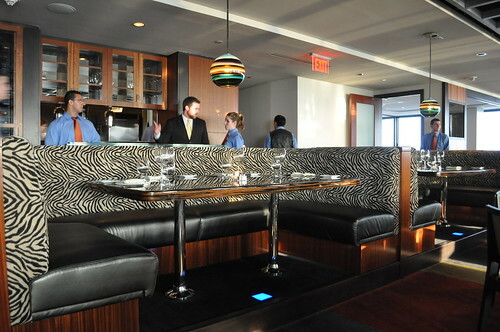 Dan had been wanting us to pay a visit to R2L, a restaurant located on the thirty-seventh floor of Two Liberty Place (i.e., a luxury condominium building which happens to be the third highest skyscraper in Philadelphia), so we had made dinner reservations for last Saturday night. Chef Daniel Stern heads the kitchen at R2L (most likely standing for Restaurant Two Liberty, but who knows, haha), taking traditional American flavors and bringing them "up-to-date with a modern twist, resulting in his unique interpretation of Creative American cuisine." The talented chef actually never formally attended culinary school, but he was still very committed to his education in the kitchen. Instead, "he sought out the best teachers in the country: Gray Kunz, Rocco DiSpirito, Jean-Georges Vongerichten, Daniel Boulud and the Ritz Carlton." 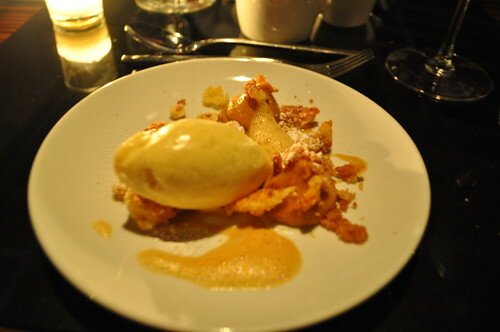 After working in the renowned kitchens of Daniel, The Mercer Kitchen, and Le Bec-Fin, Chef Stern went on to open his own restaurants in Philadelphia, including Gayle (incidentally named after his wife), Rae (named one of Esquire Magazine’s Best New Restaurants of 2007), MidAtlantic, and of course, R2L. The interior of R2L is to "reflect the Art Deco look of its building's exterior" and to "pay tribute to the mood and essence of that time." I really admire that silver-framed sculpture (it is actually made using eating utensils--forks, knives, and spoons)--it's creative and stunning! 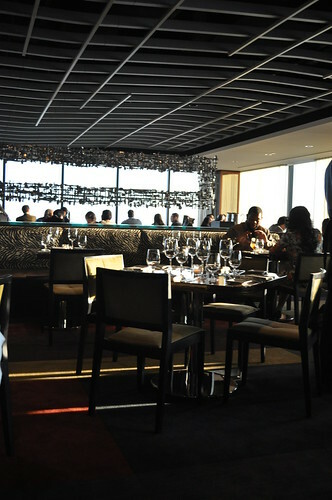 the windows of the restaurant form a C around its dining room and bar area, showing off spectacular views of the city. Inside the dining area. Although, Dan and I weren't too crazy about the zebra-printed seats, we thought the interior was very modern and sleek. 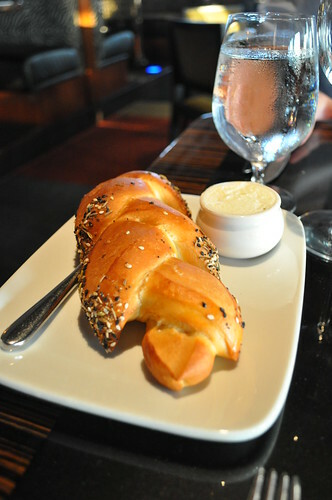 "Bread" influenced by the Philadelphia pretzel--it was seasoned with a bunch of herbs and spices on its sides. 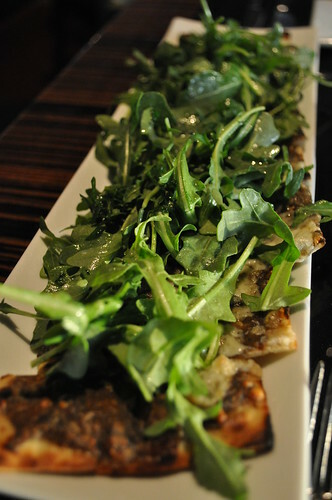 Dan and I started with the grilled truffle flatbread topped with arugula and fontina cheese, served with shaved Parmesan on the side (per my request). Typically, I tend to stay away from dishes that are covered in many types of cheese (especially if I'm not very familiar with their particular tastes--e.g., three-cheese pastas are a no-no for this girl's stomach!). Somehow, there was something in my gut telling me that I would be missing out on something quite awesome if I didn't let go of my stigma for mixed cheeses in any dish. So, to Dan's surprise, I decided to be adventurous and suggested we order the grilled truffle flatbread. Despite his initial surprise, I'm pretty sure he was totally relieved to know we wouldn't be missing out on a really good (but cheesy, literally) starter. I had nixed the lobster macaroni & cheese from the get-go because in my past experience with mac 'n' cheese, chances are I cannot eat or digest it--because of overall cheesiness and lactose-filled distress--even though it could be very well amazing. I just didn't want to chance it for either of us. Please forgive my slight aside--back to the flatbread at hand! It was extremely aromatic--you can smell those grilled truffles wafting through the air, with a bottom line: seducing its captivated prey. It came warm and toasted, oozing with cheesy goodness (who knew I'd ever say such a thing?!) that intensified the flavor of the grilled truffles. The flatbread merely served as the savory medium in which this entire experience was delivered. The contents-to-flatbread ratio was the optimal combination--not at all dough-y, just the right thickness to it. The arugula added a nice touch as well, giving some soft, natural crunch. Goes to show me that it can pay off to be a little more adventurous, veering a bit out of my comfort zone. Who knows what dishes I totally missed out on because I preemptively judged a dish by its mixed cheese content?! 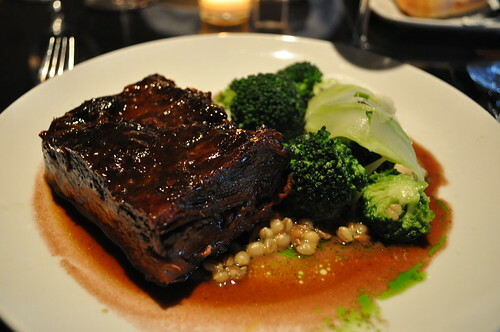 As my main course, I went with the red wine-braised short ribs with a side of broccoli with garlic and grains (from the Prepared Simply section of the menu). The short rib meat was really soft (that falls-right-off-the-bone texture, mmm). The red wine was lovely, too, bringing out the heartiness of the short rib. The broccoli was prepared very nicely with a soft garlic flavor over a bed of grains (mostly barley) cooked al dente! I recommend this dish for all those beef lovers out there and for those looking for a simple, uncomplicated dish as a main course. 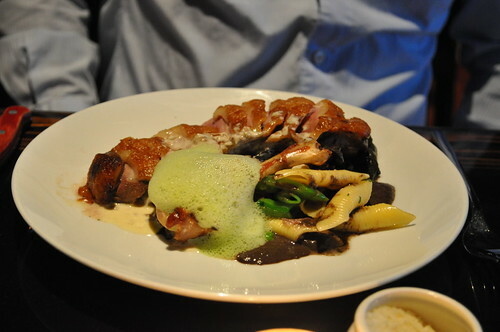 Dan went with the duck breast (from the R2L Signatures section, i.e., a list of main courses that are Chef Stern's signature offerings) with peas, black trumpets, pasta, and confit. From what I recall, Dan really enjoyed the duck--it was very juicy and flavorful. The side of black trumpets were lovely as well--very earthy! Dan and I opted to share the cinnamon toast crunch with hazelnut pudding and donut ice cream for dessert. Though I expected for it to taste like the cereal (cinnamon swirls in every bite! ), it was definitely Chef Stern's twist on cinnamon toast crunch. It had hints of cinnamon, a crunch (from the granola-like things sprinkled throughout), and the cereal milk in form of donut-flavored ice cream and hazelnut pudding. I thought this was well-executed as well as a nice, unexpected surprise, as it tasted just a good as the cereal, just very different. Findings: Dan and I enjoyed our experience at R2L very much. The first thing of note was that our server was very welcoming, was eager to help us through the menu, and was happy to answer all of our questions about the menu. He was certainly happy to be there with us that night, and it really made our dinner that much better. Also, the view from the thirty-seventh flood of Two Liberty Place was lovely--though, the best time to look through the windows is around dusk, when the sun isn't beaming at your eyes. 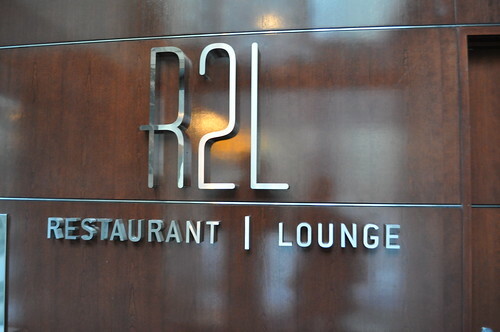 Overall, I had nothing bad to say about R2L--every aspect of the ideal dining experience at a high-end restaurant was met with elegance and a welcoming attitude. These experiences are hard to come by these days (where service and food come hand-in-hand), and I was fortunate enough to have a few great ones this year, including here at R2L. Price point: $15 for the starter, $30-32 for each main course, $6 for dessert. those short ribs made me drool on myself. GAH. ah i miss philly's eats.